A one-person exhibit of drawings by FSU Art Alum Lourdes Perdomo. 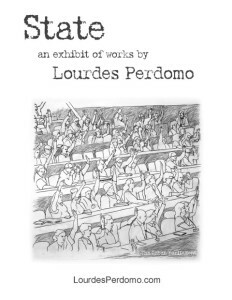 STATE – about the abuse of power and coercion by the State that has evolved into broader, visionary depictions of possible dystopian worlds. These are large colored pencil and gouache drawings on heavyweight printmaking paper. Opening reception June 4th. May 26th – July 17, 2015. Georgia Perimeter College, Clarkston, GA. The exhibition and reception are free and open to the public. For information call 678-891-3572.